My mind rains down memories thought long forgotten. There was this kid, Fred, in my junior high school. I can’t remember his last name. There was something I liked about him. He was different, that is, from me. He was a twelve-year old chubby catholic boy with thin, straight blond hair, a pug nose, and icy blue eyes. Fred entered Leeds Junior High School, not in the 7th grade, like everyone else, but in the 8th grade. No one knew why, except me. Fred got kicked out of St Raymond’s, a catholic school in my neighborhood where the girls wore pleated, navy blue skirts and white pressed, button down shirts and were the prettiest, most off limit, sexiest creatures walking on two feet. At least that was how I felt about them, a brown eyed, wavy haired Jewish boy. Fred spent only one year at Saint Raymond’s, a year which suddenly ended the day a nun hit him across the knuckles with a ruler, over and over again, for passing a note to one of those particularly cute girls. Without thinking, like lightning, Fred snapped that ruler from the nun’s hand and smacked her across the face with it. There we were, Fred and me, meeting up in the pitch dark, at 7 AM, on a wet, windy December morning. We had to get to choir practice by 7:30AM – an hour before school started. We were waiting for “chicken legs” to come in, our choral director. I was amusing myself, and showing off, swinging back and forth between two chairs, as if I were on the parallel bars. The goal was to swing up to a handstand. Fred was sitting on one of the chairs and Glen Fortunato on the other. I remember Glen’s last name because he was the kid that suggested I go out for the gymnastic team. I wish I knew where he was now, so I could thank him for saving my life. With one free, fateful swing, I swung up to a perfect handstand, and just as I did I caught a glimpse, between my arms, of old chicken legs walking upside down into class. That was it. I was kicked out of the choir, on the spot. I liked singing. I liked singing a lot. I liked singing so much that when my parents bought their first stereo, a Magnavox, a cheap, essentially empty box housing a record player with an automatic arm, and a “diamond” needle, capable of playing 45’s, 33’s, and 78’s, (the setting that worked for some of my grandfather’s thick, old records), I was ecstatic. Not only did we get the record player, we got twelve long-playing records, all at once, from the Columbia Record Club. I proceeded to listen to these records, constantly, until they were ingrained in my brain where they remain in tact until this day. My Fair Lady, Oklahoma, Gigi, Chinatown, West Side Story, Showboat, Johnny Mathias, Andy Williams, Judy Garland, Gershwin’s Rhapsody in Blue, and An American in Paris, Ferrante & Teicher, two guys that played piano back to back, and finally, Dvorak’s New World Symphony. Around the new stereo, there were four large, square, plastic cushions; two were black and two were powder blue. The cushions had black tassels dangling from the four corners of each pillow, like some Jewish/Japanese tallis. I would place two cushions under my head, position my head precisely in between the two speakers – real stereo sound – and there I would remain for hours, listening and singing, but most importantly, imagining. Suddenly, something would possess me. I had to move. Reflexively, I’d spring up and start doing handstands against the wall, then handstand pushups, many of them. When my arms began to shake uncontrollably, I’d spring onto my feet, leap up the steps, three at a time, turn around, lean forward, then execute near flawless falls down the steps. Usually I waited until my mom was about to go upstairs for something. I’d let out a terrifying scream, and down I would roll head first against the right wall, then into the banister on the left, until I landed in some contorted position at the bottom of the steps, moaning in pain, like I had just broken my neck in four places. Directly I was sent to my room “to settle down.” Head lowered, I would gently close my door, take a deep breath, and proceed to throw all my pillows and stuffed animals up into the air and see how many I could strike, kick, and kill, before they touched the ground, dead. Twelve causalities was my record. I had never heard of, or seen a martial artist, but without knowing it, I had begun my training. After an hour of punching and kicking and sweating I would feel, how should I say, rested. Now that I think about it, Fred and I were not so different. And maybe that explains why we decided one Saturday morning to take a hike together. We put some water in a couple of aluminum canteens covered in green army canvas, with thin straps enabling us to wear them slanted across our hairless chests, making us look like the tough guys we believed we were. We headed off into what was, for us, unknown territory, well beyond the borders of East Mt. Airy, our neighborhood of endless two-story, red brick row houses. We ventured all the way up to Ivy Hill Road, which was like the northern most edge of the world. I looked up to the top of a big radio tower, and there it was, the red flashing light. “Good night,” she’d sing as she swaggered cheerfully out of my room, feeling like she’d performed a minor miracle, or won a major world war. Bruce was down for the count. As soon as my mom was gone I’d throw off my covers, kneel Japanese style at the foot of my bed, and gaze out my window over the flat rooftops into the night sky. Living in the city, and unlike the planetarium, there were not many stars to see. The few I could see were white and twinkling except for one, which was red, and flashed on and off, like it was breathing. God, I thought. That must be God. It didn’t occur to me to wish for anything, or tell anyone. It just felt like a secret that deserved to be kept. So when I saw that red light flashing on top of the radio station, I felt hurt, and embarrassed. Once I had believed in that red star. I believed I was, in some mysterious way, connected to that red star. Maybe that red star had something to do with my unusual amount of energy? It was a real disappointment seeing the red light just sitting up there atop some big, metal erector set. But I accepted it as a signal. It was trying to tell me something, in code. But what? Exactly what it was Fred and I were looking for, we wouldn’t have been able to say back then. But now I know we were out there looking for a world we could live in. We turned left, and headed down Ivy Hill Road, past a cemetery, ducked under a fence and came upon a huge green pasture. There, standing before us was a big, official looking sign. It read: The U.S. Department of Agriculture. No Trespassing. Fred and I looked at each other and thought the same thing at the same time. How can you be on an adventure without trespassing? So we disregarded the warning. We broke the law. We became partners in yet another crime. I had never seen such green grass, and so much of it, so much green coming into my eyes all at once. We took off our shoes and socks. The grass was thick. I could feel it pushing up between my toes. 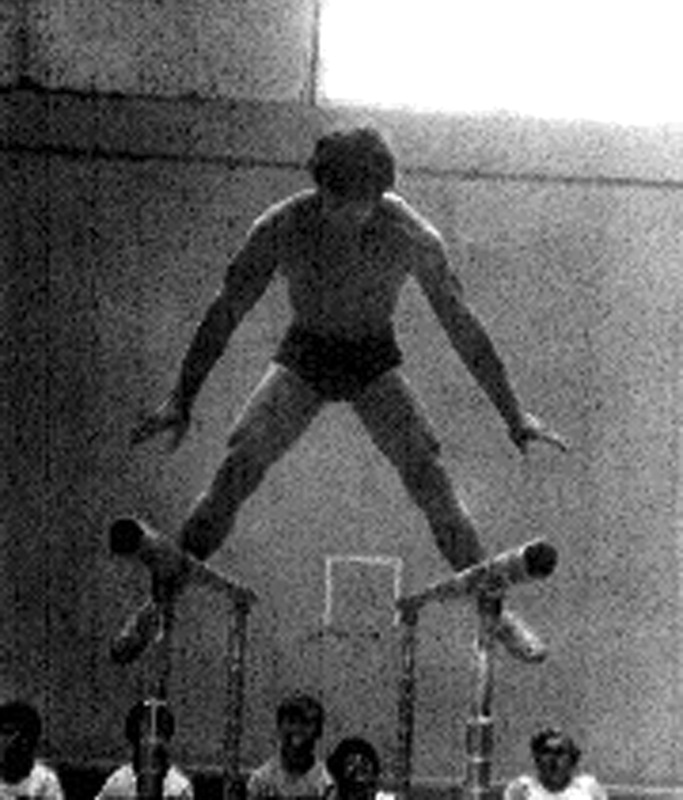 I gave my shoes, my socks, and my canteen to Fred, then proceeded to execute high, arching dive rolls over and over again, the kind I did in tumbling club, flying over twelve boys, on their hands and knees, lined up in a tight row. As soon as I caught my breath, I proceeded to do a back handspring, then another and another, an endless row of back handsprings, each one faster than the one before, until I was so dizzy I could not tell the difference between the blue grass and the green sky. Fred attacked me when I was down. We wrestled and rolled until we were dripping with sweat. Out of steam we pulled up some long pieces of grass, leaned our backs against the trunk of an old tree, legs outstretched, ankles crossed, put the grass in our mouths, and chomped on it like two hobos. We sat there, under the tree, by the railroad tracks, waiting to see what would happen. I had placed three pennies, and one Indian head nickel, on top of the tracks. As if by command, a big, slow moving, mammoth locomotive, with a half dozen or so cars attached to it, appeared, and rolled over our little silver and copper coins. Totally smashed, hot to the touch, Fred picked up the three pennies. I picked up the Indian head and gave it to Fred, which was not easy. We were true friends, together on a true path. We came to a particular street. This was no ordinary street. It was Stenton Avenue. Crossing Stenton Avenue meant being out of our neighborhood. We knew this to be an indisputable fact, because we knew if our parents knew we were about to cross Stenton Avenue, they’d be furious, and we’d be in big trouble. There we stood at the red stoplight, at the intersection of Ivy Hill Road and Stenton Avenue. We knew crossing Stenton Avenue meant, yet again, breaking the rules. The light turned green, and without hesitating, we flung our arms around each other’s necks, defiantly tossed our heads back in delight, and floated across Stenton Ave.
Once on the other side of Stenton, the railroad tracks mysteriously disappeared. We climbed down a steep hill and found ourselves in a forest. A tiny brook trickled by. A fawn stood motionless. Rays of light shone through the trees. There was no turning back. We had crossed over. Fred and I followed that brook until it became a stream. We followed that stream until it became a river. We followed that river until it met and flowed into an even larger river! Then we called my mom. Luckily, Fred had a dime in his pocket and enough sense not to have put it on the railroad track. I told my mom we were in some really big city, maybe downtown Philadelphia. I told her we had no money, that our socks and sneakers were soaking wet, and that we were starving of hunger. My mom picked us up. Silently, we drove back up the river, crossed over Stenton Avenue, passed by the flashing red light atop the radio tower, drove by Leeds Junior High School, and Saint Raymonds, and re-entered our old neighborhood. I needed some air. I rolled down my window and stuck my face out into the wind. The little red row houses looked smaller than ever. I greatly enjoyed this story, Bruce! I could picture it so clearly.